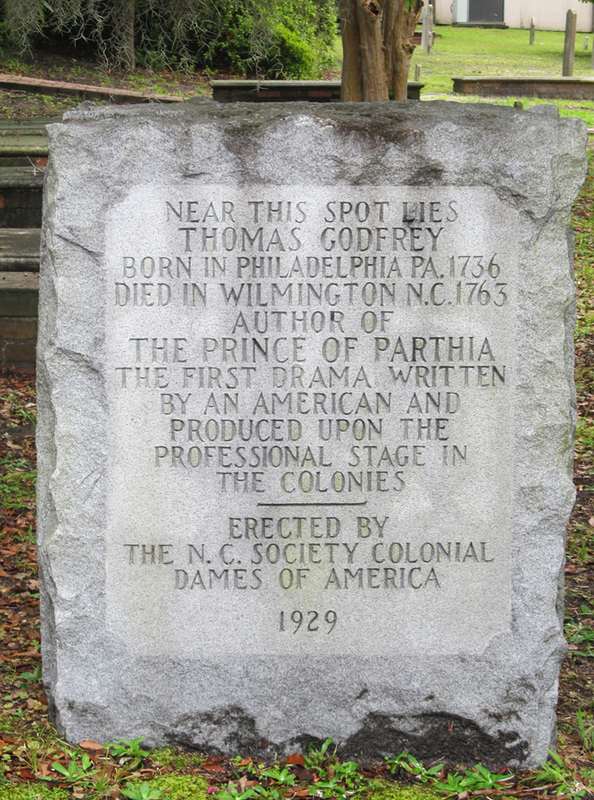 Source: Thomas Godfrey Memorial, Wilmington. Photograph courtesy of Natasha Smith. The grave marker, approximately three feet tall, is a rough cut block of granite with a partially polished face. The face bears an inscription to the memory of Godfrey. McEachern, Leora H. 1985. History of St. James Parish, 1729-1979. 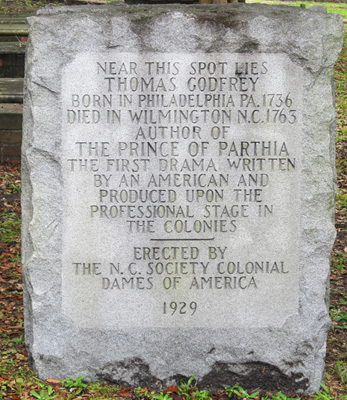 Wilmington, N.C.
Thomas Godfrey was born in Philadelphia, the son of Thomas Godfrey the inventor. The elder Godfrey was the inventor of the navigation instrument, the octant. The younger Godfrey had a very short life, living to the age of twenty-seven. He served in the Seven Years' War after being apprenticed to a watch maker, and subsequently located to Wilmington where he worked as a merchant's factor and where he reportedly wrote "The Prince of Parthia." The play has been regarded as the first to be written and performed in the American Colonies. Godfrey also penned a number of poems. The marker is located in the graveyard of St. James Church, on the corner of 4th and Market Streets. The marker sits in the grass in the graveyard next to the church buildings. The graveyard is separated from the street and sidewalk by a low gridiron fence and is graced by shrubs, plantings, and mature shade trees. The N.C. Society of Colonial Dames of America were given permission in February 1929 to erect a stone to Godfrey's memory in the graveyard.